This series of A4 booklets is an ideal format for the publication of studies undertaken as part of an academic course, as well as non-academic in-depth studies. 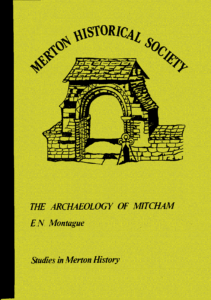 In this study Eric Montague, late Vice-President of MHS, records the history of the site, the dig, the finds and his conclusions. This 32-page A4 booklet has 18 illustrations (maps, plans and photographs) and sells at £2.50 (£2 to members) plus £1.20 postage. 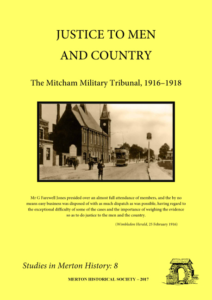 In this study Keith Penny provides information on the ever-changing regulations regarding conscription, and the way these were administered in Mitcham, as reported in the local newspapers of the time. 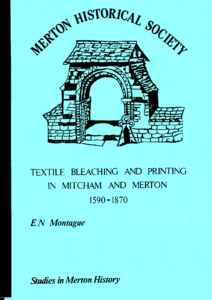 Using primary sources where possible, the author examines the impact of the Civil War on the semi-rural parish which was Mitcham at the time. Topics discussed include recruitment, taxation, parish administration, social structure and even the property market. The ledgerstones (inscribed flagstones used to seal graves and vaults) in Mitcham parish church have been concealed under the carpeted floor since 1991. Fortunately Ray had photographed many of them, and had copied the inscriptions, shortly before they were covered, and this book reproduces this material, together with biographical notes. This book is a must for local and family historians. 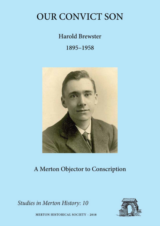 In March and April 1916 Harold Brewster, a surveyor’s assistant employed by Merton and Morden Council, argued his case in front of two tribunals that no earthly court had a right to come between a man and his conscience. His conscientious objection was to the undertaking of all forms of military service. Resisting conscription exposed him to the hostility of the majority of the population and to the penalties, short of death, that military and civil rule could impose. In this study, Keith Penny traces the full range of the penalties that young Harold Brewster endured in the name of conscience. 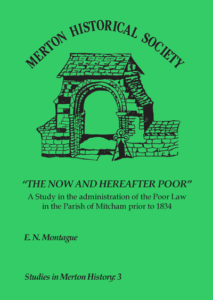 A private Act of Parliament, obtained in 1816 “For the better assessing and collecting the Poor and other Parochial Rates in the Parish of Mitcham, in the County of Surrey” is reproduced in the Appendix. 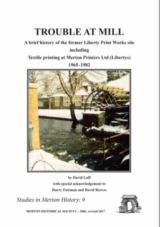 David started work at Merton Printers Ltd in January 1965, and completed the last-ever print-run at the Merton Abbey Works before it closed in December 1982. 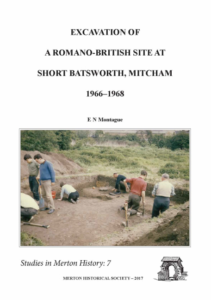 In this book David traces the early industrial history of the site, and then takes us on a personal tour of the production processes, introducing us to many of the personalities along the way. This unique view ‘from the shop floor’ makes fascinating reading, and the abundance of photographs, diagrams and plans complement the text perfectly.